Since using Marsello, CreaLunch have doubled their customers' average spend per order with their beautifully branded loyalty program. Montreal-based lunch caterer and delivery service Crealunch are a cut above the rest. When friends, Najib and Valentin, saw a need for healthy, delicious and affordable lunch options for their time-poor professional peers they knew they could provide an answer. With Najib’s seasoned cheffing experience and Valentin’s marketing know-how, the two friends are offering Montreal’s young professionals lunch options that are fast, beautiful, healthy and delicious. Crealunch used Marsello to create their generous loyalty program. Their attention to detail and customer care sets them apart; not only have they developed a detailed loyalty program, but they’ve also gone the extra mile and added their branding throughout all of their marketing. A colorful image of one of their delectable looking lunches borders their widget, enticing their customers to sign-up and keep returning. With a return rate of 75% they’re achieving great things! Crealunch have gone above and beyond to keep their customers feeling included! Hailing from Montreal means that the team at Crealunch live in a bilingual city where both French and English are used daily. Crealunch have risen to the occasion by offering their website and menu in both English and French, literally and figuratively catering to all of their customers. Even their communications with their customers incorporate both languages – they have customized their loyalty widget to accomodate all of their customers and this inclusion helps to increase the diversity of their customer-base. Just take a look at their loyalty widget below. Bien joué ! Good work! Once they've started earning, customers can redeem points for Crealunch lunches. When customers earn more and more points, they unlock delicious rewards, with up to 1, 3 or 6 free Crealunches up for grabs depending on how many points the customer has accumulated. The team at Crealunch have not only boosted customer retention with their generous loyalty program, they've also added a referral program for their customers. The referred friend is incentivised with 10% off their first order and the customer earn 1000 points when their referred friend makes their first purchase. With so many ways to earn points, it's not hard to see how Crealunch are seeing such great results. Within each product listing on their website, the guys at Crealunch also include a list of the nutrition facts. This next-level of engagement lets Crealunch customers make the best choice for themselves by knowing exactly what they are buying. This transparency shows exactly what Crealunch are producing and that their lunches are really a healthy option for Montreal locals, giving them a competitive edge. The folk at Crealunch know their food is as eye-catching and visually appealing as it is delicious, and their combined talent for presentation means that Najib and Valentin are an Instagram dream-team. Their feed is filled with beautiful images of their products and branding, only further reinforcing them as a leading lunch catering option within Montreal. If their Instagram can inspire hunger from across the other side of the world, it's not hard to see how it adds to their local customer growth. 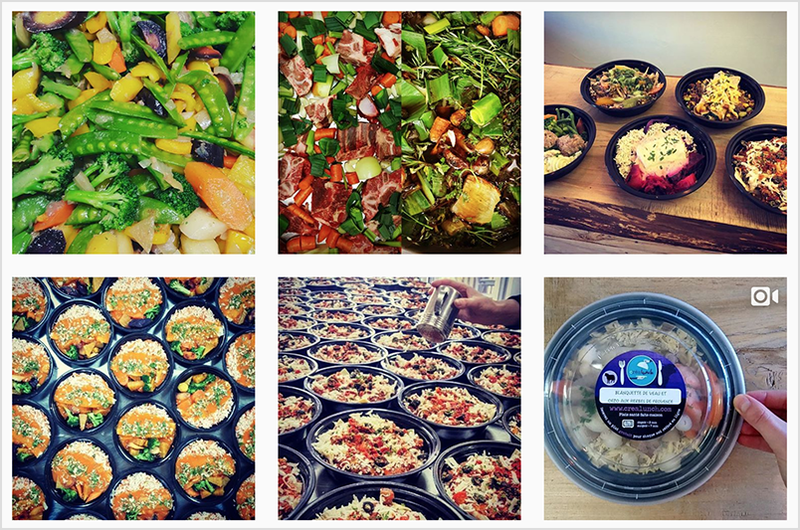 Feeling curious about how Crealunch create their delectable dishes? Their facebook page banner shows an example of some of their lunches being made and the beautiful imagery could convince even the most distant customer to stop by Crealunch's Montreal store to try it for themselves.